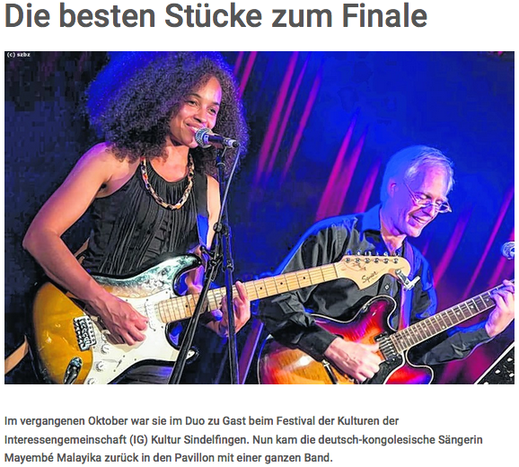 Samyra Manka’a discusses with German singer Mayembe Malayika, highlighting roots, influences and diversity. 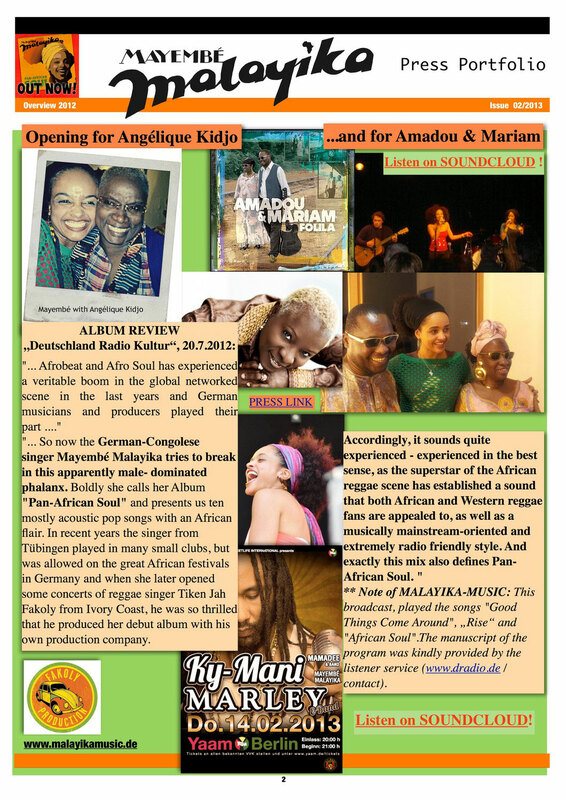 MAYEMBÉ MALAYIKA lance "Pan-African Soul"
"La scène afrosoul-allemande s’enrichit d’une nouvelle voix : celle féminine et bien chaude de MAYEMBÉ MALAYIKA..."
Show with AMADOU & MARIAM! 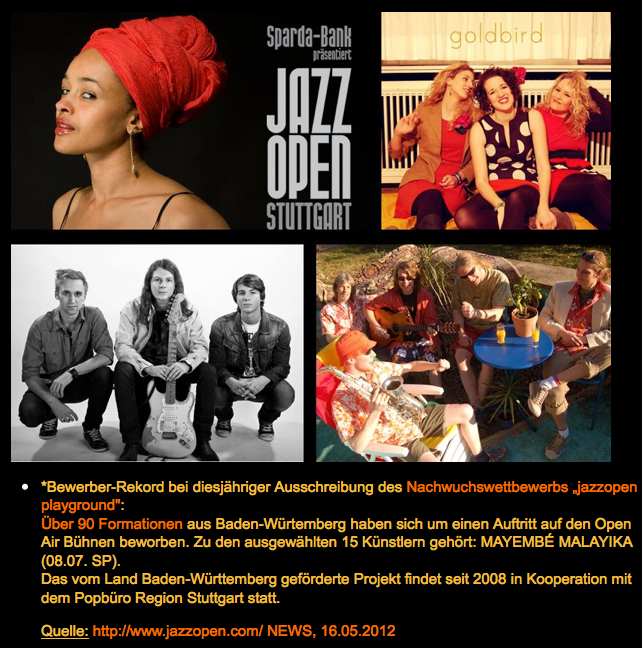 "African and soulful beats were getting more popular here (Germany) in the last years. 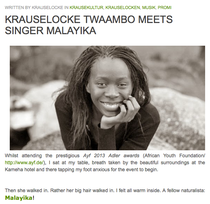 Even though male singers are still dominant in this scene, more & more women with African roots, born and raised in Germany, are breaking through..."
"...she is proud, confident and her voice has potential: Mayembé Malayika, a singer from Tübingen with african roots is turning chilly concert halls to the warmest places in the world..."
Mayembé Malayika wins the „jazzopen playground" contest 2012 and gets the chance to play on the Main Stage of Jazzopen Stuttgart as the Opening Act for Katie Melua. 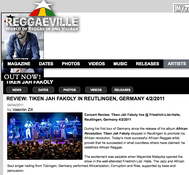 "...his album African Revolution, Tiken Jah Fakoly stopped in Reutlingen to promote his African revolution. 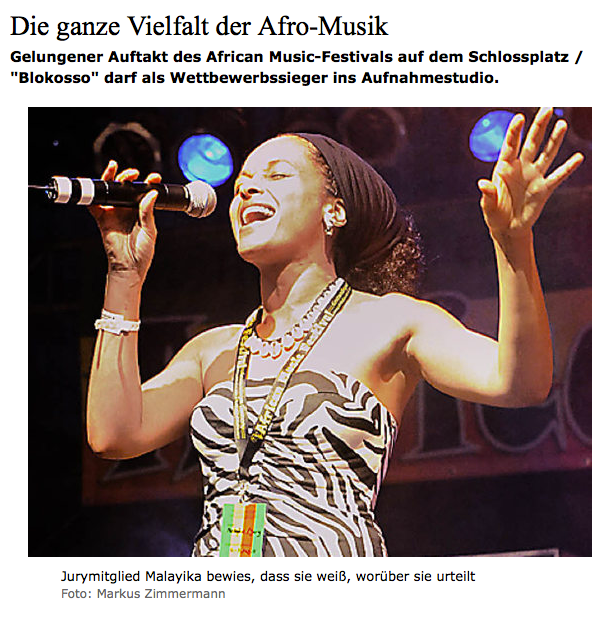 Today‘s most successful African Reggae artist proved that he succeeded in what countless others have claimed: he redefined African Reggae. MM feat. 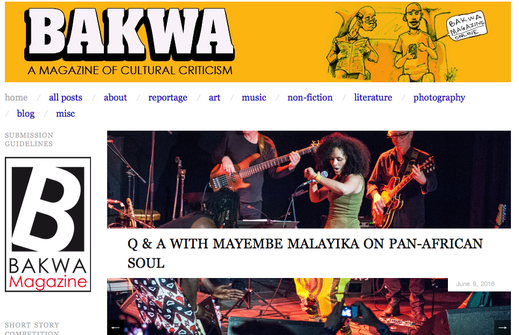 in Twaambo Kapilikisha's MUKAINTU Blog. 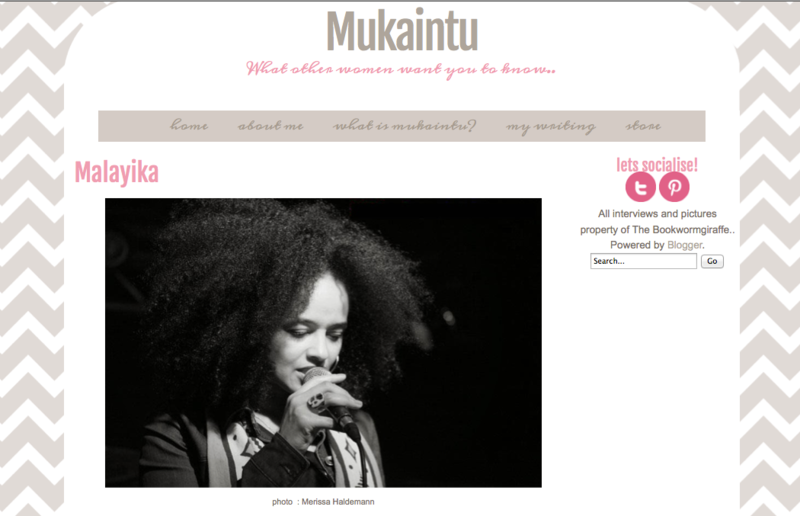 "What do you celebrate abut being a woman? 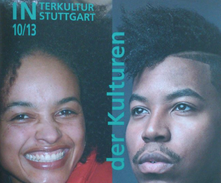 I think we are highly compassionate. Besides that I'd rather say, I have a lot to be thankful for, first of all being alive, no matter of gender - it's a precious gift. Lately..."
MM feat. 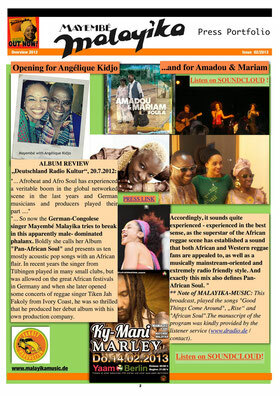 in multicultural, urban online magazine. 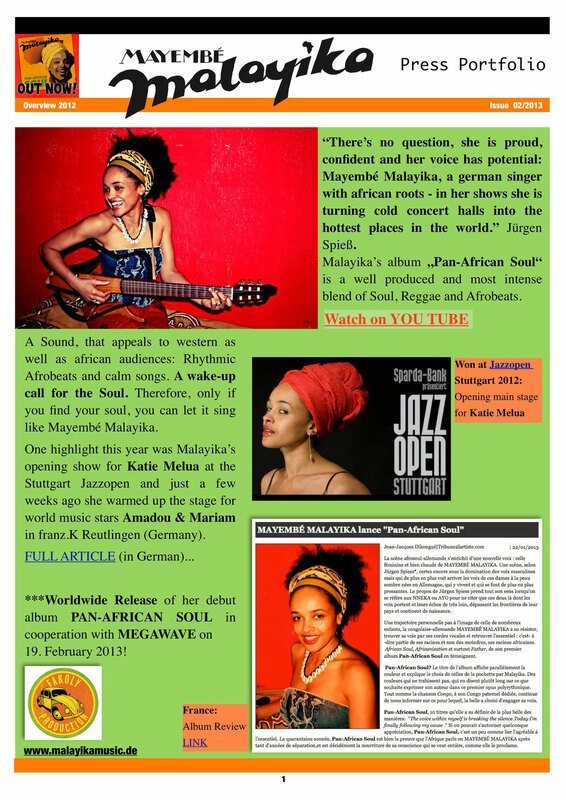 'Do you believe that your hair influences your music in any way? "...Mayembé Malayika's "African Soul" was well received at the Afrikafestival Tübingen 2011..."
in addition Mayembé Malayika performed one of her own songs acapella..."